The élance family of integrated monitors offers you high-performance monitoring of essential parameters. 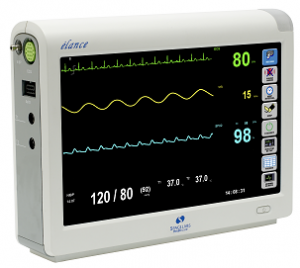 They are available with two sizes of ultra bright wide color displays (10.2” or 12.1”), for clear visualization of up to five waveforms and up to seven numeric displays. All models provide 120 hours of trends. These light, slim monitors – only 5 lbs and 2.8” thin – fit comfortably into the most crowded bedside environment. Uninterrupted monitoring is assured – all élance monitors will run for up to five hours on their powerful, internal lithium-ion battery. Their integrated handle and simple mounting solutions make them ideal for any location. Each model monitors ECG (3- and 5-lead), respiration, noninvasive blood pressure, peripheral O2 saturation and two temperatures. The “i” models add two channels of invasive blood pressure, and the “c” models add microstream end tidal CO2. An élance Central Station brings together information from up to 32 patients. Finally, élance monitors are intuitive and easy to use – their touchscreen user interface with a single level menu provides quick, simplified operation.